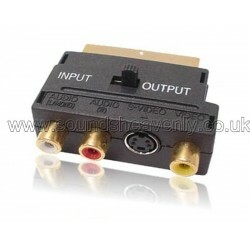 The SCART to RCA adapter plugs into a SCART (21 pin) socket on your TV to allow input -or- output of stereo audio (Left + Right channels via two RCA/ phono sockets) and composite video (single RCA) or S-Video/S-VHS. A switch on the adapter allows you to choose whether to play sound and pictures from an external device onto the TV (IN) or to play sound and pictures from the TV out to an external device (OUT). This adapter is particularly useful when connecting portable music players into older televisions with limited input sockets, as they can be combined with our wide range of audio cables to allow almost any audio product to be played through your TV. Another popular use for this adapter is to take an audio output from a TV that does not have dedicated sockets for this purpose, so that the sound from the TV can be played through external speakers. 1x Male SCART plug on the other side. Gold contacts and sturdy construction for a long life and a perfect connection every time. Please note that the adapter is NOT suitable for the BeoVision 5 TV, as this has restricted space around the SCART sockets. Please contact us if you need any further advice on how and when to use this product and we will be pleased to help.